Common Mullein or Great Mullein, a biennial introduced, does not go unnoticed, it can reach more than 2 meters (7 feet) high, at least the second year of its life cycle, the first year, Common Mullein displays a rosette of large hairy green-gray leaves. Considered as a weed, it can become invasive, but it is non toxic (see Uses section). Luckily it is not dangerous for humans because its seeds retain their germinating power for decades, even beyond 100 years. 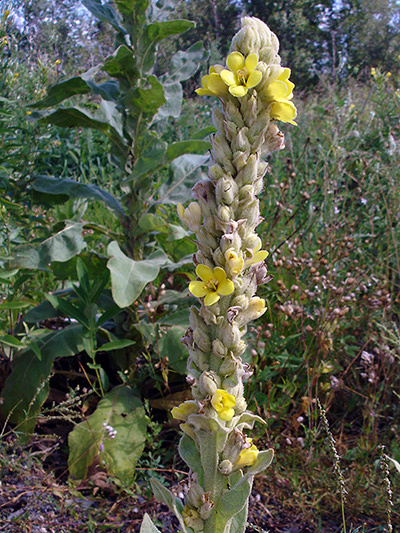 Although inedible, Common Mullein has many uses for humans (see Uses section). Each flower of the Common Mullein persists only one day, but they do not open all at once. In our more northern latitudes Common Mullein can live three years instead of two, it needs then a longer period of growth, and flourishes only in the third year.